At 2pm tomorrow Southern Health will be up in court on charges relating to LB’s death. The Health and Safety Executive are prosecuting Southern Health NHSFT under Section 3 of the Health and Safety at Work Act 1974. You can find out more about the act and how they enforce it on the HSE website here. Also on their website is a database HSE Public Register of Convictions that makes for grim reading; it contains all cases and breaches successfully prosecuted by the HSE in the previous 5 years. There is also a HSE Public Register of Convictions over 5 years old. Failing to control legionella. A joint investigation by the Health and Safety Executive (HSE) and Sussex Police identified a history of failing to manage the deadly waterborne bug. Maidstone Crown Court heard how the man, who was suffering from dementia, was being cared for at the Frank Lloyd Unit, Sittingbourne, by the Kent and Medway NHS Social Care Partnership Trust. On 9 April 2008, he was being bathed, slipped from the hoist and fell about three feet suffering serious injuries. He died the next day in Medway Maritime. Kettering General Hospital NHS Foundation Trust (KGH) has been fined after an employee received serious burns whilst stripping down a steam boiler. Failed to provide adequate control measures for a patient who had been identified by consultant psychiatrist as at risk to himself and did fail to review said risk assessment, there having been a significant change in the matters to which it related. Four patients lost their lives because a lack of safety procedures at Mid Staffordshire NHS Foundation Trust resulted in careless and unnecessary failings. Patient committed suicide through asphyxiation using a plastic bin liner. The NHS Litigation Authority has been prosecuted after an 82 year old man fell 12 feet to his death from an elevated walkway outside Fareham health centre. Fareham Health centre was owned at the time of the incident by NHS Hampshire and let out to NHS Portsmouth, but these bodies were abolished in 2013. The NHS Litigation Authority has taken on criminal litigation for the abolished health bodies. In this case the PCTs concerned were Portsmouth City Teaching Hospitals Primary Care Trust and Hampshire Primary Care Trust (‘the former PCTs’). An in-patient was left unsupervised on a hospital ward. The patient subsequently drowned in a bath. A patient taken canoeing who during the activity removed his buoyancy aid and jumped into the water in an attempt to end his own life [HSE press release here]. An NHS Foundation Trust has been fined for safety failings in its management of the use and maintenance of Anetic Aid QA3 trolleys. It is understood that even though a window restrictor has been installed the patient somehow managed to get through the opening between the window and the frame and fall from the second floor. The patient was in his own room which is directly behind the Nurses’ station. The patient was brought to theatre and operated on but later died. Mr Withers absconded from a courtyard area over a flat roof and then climbed a chimney stack and fell from the chimney and sustained fatal injuries. HSE told the court that University Hospitals of Morecambe Bay NHS Foundation Trust failed to ensure that they managed the risk of bedrails, which is a fundamental element of patient safety for which extensive and comprehensive guidance on risk, management and policies existed. Lincoln Crown Court heard that Mr Biggadike, who was a patient at the hospital, died on 10 April 2012 from internal injuries after falling onto an exposed metal post on the standing aid hoist that staff were using to support him. None of these 15 successful prosecutions relate to patients with a learning disability, despite there being a long list of preventable deaths in NHS care, in particular in so called Assessment and Treatment Units. Nearly all of the prosecutions include gross failings of management to protect staff and patients. Attention is also drawn to the pointlessness of having policies and procedures in place if staff are not aware of them, or are inadequately trained to execute them. One particularly repulsive factor of these criminal prosecutions is the audacity in which NHS trusts, who have been prosecuted for gross failings, not to put too fine a point on it prosecuted for breaking the law, many with the gravest of consequences that have cost patients their lives, are prepared to haggle about the sanction given to them. Postscript: Michael Buchanan, the brilliant BBC journalist has shared that he was in court for the Surrey and Borders prosecution and that they also spoke about NHS money pressure to reduce their fine. It’s funny how the NHS never struggles to find large sums of money to pay the CEOs with no real accountability or other executive directors, or for that matter to attend award ceremonies, but it has no shame in arguing that it can’t find money to pay a fine. I’m currently reading Elizabeth Stanley’s (2016) book The Road to Hell: State Violence against Children in Post War New Zealand. Stanley’s account of the experience of 105 New Zealanders institutionalised in the name of ‘care’ and faced with decades of abuse is harrowing, and important, and a highly recommended read. It is situated within a context of a campaign led by the New Zealand Human Rights Commission ‘E Kore Ano, Never Again‘ that calls for an independent inquiry to deal with abuse of children under state care. The New Zealand government appears adept at downplaying the seriousness of people’s experiences and denying their responsibilities. Stanley takes apart the government excuses in this post here. ‘We often do not register harms committed by institutions or state workers. We frequently fail to contend with the structural, cultural and social underpinnings of violence, preferring instead to blame damaged individuals, dysfunctional families, or even sometimes pathological communities… Denial seems like an easier route. One of the reasons why denial operates so effectively is that there is an impossibility of telling about violence’. ‘The state does not see its own violence. We are quick to vilify violent criminals, especially when they are young. We are increasingly ready to recognise and deal with family violence and neglect. But we are slower to recognise state violence. In the institutions that cared for children over three decades in New Zealand, state workers used a host of violent punishments, isolation techniques and damaging medical treatments to make children comply with their demands. With a few exceptions, there has been little social or state admonishment of this institutionalised violence. Wrapping it up in the language of rescue, welfare, treatment or discipline, we somehow give this violence legitimacy’. ‘Authorities argue that they acted out of necessity, to protect New Zealanders from unruly youngsters, and that the institutionalisation of thousands of children was for the good of society. Workers wouldn’t need to put them into secure for weeks if they complied with rules and didn’t run away’. These denial tactics read like a handbook for those who seek to deny and deflect NHS failings. LB died in July 2013. 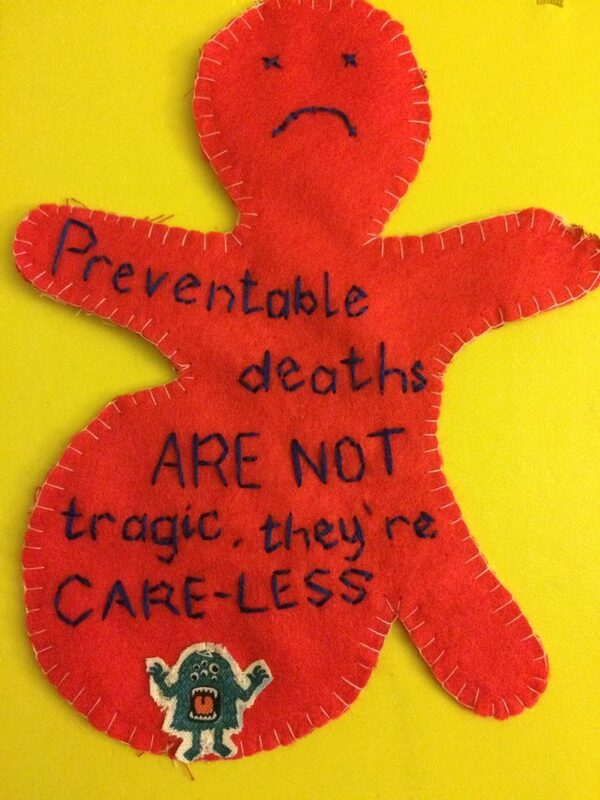 It is over four years since then and #JusticeforLB is still seeking accountability for his entirely preventable death. The writing was on the wall long before LB was admitted to the STATT unit. Katrina Percy appointed Mike Holder, as Interim Head of Health, Safety and Security. He resigned after three months, when it became clear that the Trust as not only failing to meet its legal requirements, but had no intention of improving things. He wrote a 12 page report detailing his concerns, the trust’s failings and warned them that they were breaking the law. They chose to ignore his recommendations and wilfully and knowingly, in full view of the Trust Board, continued to break the law. This professional arrogance and wilful neglect was happening years before LB was admitted into their care. The Trust wilfully ignored enforcement notices from the CQC and are currently facing another prosecution led by them. Since LB died Southern Health and its representatives have repeatedly engaged in all the tactics of denial that Stanley flags in her book. They have claimed LB’s death was down to natural causes. They have repeatedly tried to blame Sara, LB’s mother for failing to raise concerns and failing to tell staff that LB should have been supervised in the bath. They have blamed Sara for blogging anonymously. A briefing was circulated the day after LB died about Sara’s blog and the potential risk to Southern Health’s reputation. Trust staff have left abusive voicemail messages on Sara’s work phone. Apologies have been issued to the media, to try and manage reputation. Despite supposedly accepting the Verita report findings that LB’s death was preventable, the Trust still sought to defend their actions and non-care at LB’s inquest. The inquest jury found an absolute catalogue of failings and neglect at Southern Health that led to LB’s death. The Trust spokesperson again claimed to have apologised – to a journalist, not the family. "None of us here have heard this apology. That has been strictly done for the media and their PR. "The family of 18-year-old Connor Sparrowhawk, an autistic teen who drowned in a bath at an NHS care unit, tells Victoria Macdonald they are yet to receive an apology . The Mazars report found 1% of the deaths of people with a learning disability at Southern Health were investigated over a four year period. Earlier this month I was in Manchester to listen to Dr Valerie Murphy, LB’s consultant psychiatrist suddenly, four years after his death, when faced with professional sanction have an epiphany and admit some responsibility for her failures that led to his death. Yet mysteriously last week they’d removed the report from their website. In a classic Southern Health feat of openness and transparency, they’d hidden it. 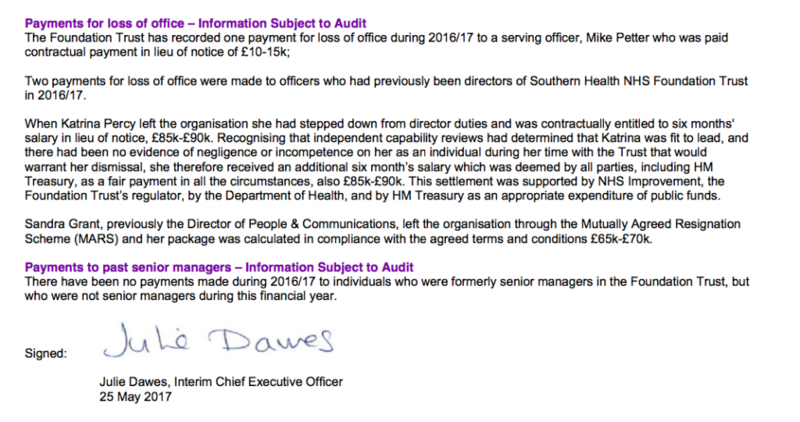 Perhaps someone had thought twice about claiming that Katrina Percy was ‘fit to lead, and there had been no evidence of negligence or incompetence on her as an individual during her time with the Trust that would warrant her dismissal‘. A Trust that faces criminal charges, a now ex-CEO who wilfully chose to ignore the advice and warnings of a Health and Safety Consultant who predicted more patients would die preventable deaths. My instinct is that Southern Health will suddenly see the light tomorrow. After years of minimising what happened to LB, of denying in every way possible the magnitude of their failings, they will suddenly plead guilty and claim they’ve made all sorts of changes, that they’re broke, and they’ll issue an apology to the media and hope everyone can move on from here. We can not as a society stand by and let that happen. We need to bear witness. Katrina Percy was a highly paid CEO, paid by the tax payer. She failed to comply with her legal duty to keep patients safe. She repeatedly and wilfully ignored warnings about the state of health and safety. As did the Board members of Southern Health. LB died due to neglect, on their watch. His death was not a tragic accident, it was a wilful failing, and there needs to be some accountability and consequences for such flagrant disregard for the law and the safety of patients.